GAS IT Stainless Steel Pigtail for gas bottles with the 21.8LH outlet tap as used on Caravan's, Motorhomes, Campers vans and More - GAS IT Leisure Gas Bottles, Gas Cylincers and Gas Tanks - Catering, Motorhome, Campervan, Caravan, Farrier and Road Repair Refillable Gas Solutions. 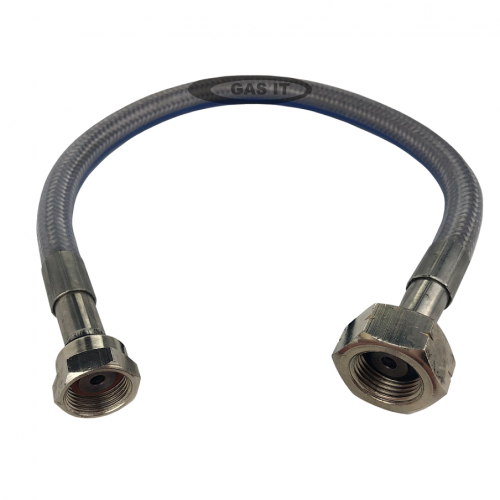 This GAS IT full stainless steel pigtail comes with the right ends on it go direct to a GAS IT Bottle, Tank or even Gaslow bottles direct to your bulkhead mounted Regulator. This Pigtail has a 20 year life span and is maintenance free.